Imagine doodling with your co-workers with the help of an artist during your lunch and learn. Or meditating in your business casuals with your team, right after work, so you can all clear your mind before you go back home to your kids. Or creating a funny family song with a local musician during your kids’ spring break. Letting your creativity flow is one of the core pieces of living well and solving problems. The process of creative expression helps us relax, unwind and de-stress, which leads to improved focus, mental well- being and overall increased productivity. In fact, creativity is one of the key elements of progress and innovation and the foundation of our country’s economy. Everything that we see around us is a result of someone unleashing their creativity and trying something new, not worrying about how it’s going to look or whether it’s going to be successful. 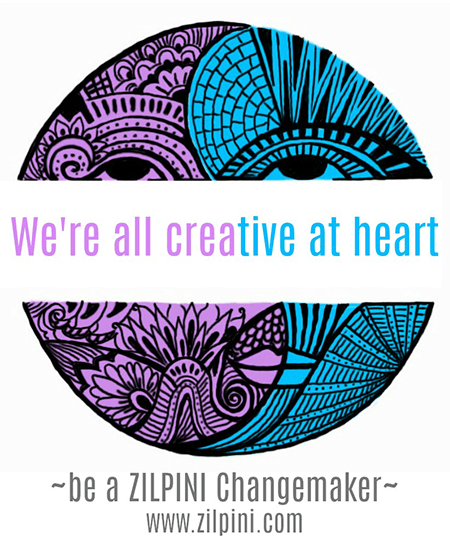 The founders of Zilpini, Surendar and Loveleen believe that creativity is ingrained in us. We’re all creative at heart. Yet we don’t let it out on a regular basis because it’s often inconvenient, inaccessible or not encouraged in our day to day life. We want our children to be playful and creative, but as we grow up we start telling ourselves we’re not creative or that it’s a waste of time or doesn’t help us in our career. But how can something be a waste of time if it improves our focus, makes us better at whatever we’re doing and reduces stress? When our lifestyle embraces time to create, we are in a flow to solve our day-to-day problems, rather than running on a hamster wheel and getting nowhere. Don’t we all want to live better? Yes we do, and unleashing our creativity helps us live better. That is the core foundation of Zilpini. We foster well-being and problem solving by bringing you the experience of creative process. In other words, opportunities to work with and beside local artists. Such experiences give us much needed mental (and physical) breaks that opens our mind to deal with our daily challenges in a more positive and efficient way. There are many ways we can work with you, from placing an artist at work, say painting a canvas on your campus, to happy hour and lunch time creativity stations and short workshops at home or office or a venue of your choice! We focus on bringing experiences of visual, performing, and healing arts to you. By creating a community of artists we make it hassle-free for you to find a local artist. By bringing activities to your location we make it convenient for you to find time to create. By giving you an opportunity to work with artists we give you a chance to learn from the experts! So if you’re ready to unleash your creativity and change the world, live better or just find a different perspective in dealing with your day-to-day challenges, come have a cup of coffee with us at our Meet and Greet next week! You can ask questions, learn more and meet our growing community of artists. You can RSVP here. Join our mission to unleash creativity and live better!